1 lb dried black eyed peas- sorted rinsed and soaked per package. 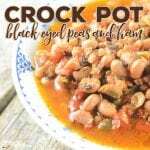 Drain soaked black eyed peas and place in the bottom of a 6 quart slow cooker. Then pour tomatoes over black eyed peas and add garlic, water, bouillon, peppers and stir well. Nestle ham bone down in black eyed peas, season with salt and pepper and cover. Cook on low for 8-10 hours or until the black eyed peas are tender, stirring a few times over the cooking period.